Formula Corp’s experience with utilizing manufacturing reps has been limited. However, since starting our relationship with Source 1 Systems, it has been a renewed interest and excitement. Finally, representation with professionalism was something that we felt has been missing in the industry for a long time…. passion. Scott, and his Associates at Source 1 Systems, are the kind of company that is needed on a team as they provide clear & concise communication for the best possible representation above all the rest. Corporate Director Sales – Formula Corp.
EDIC is a company that has grown through the years through the partnership it has with its outsourced manufactures representatives. The selling of equipment has changed over the years, and it takes a team of professionals that have the ability to system sell products at all times. Source 1 Systems does this as a standard part of their selling process and it has proven to be very effective with our product line. It is through this selling technique that our product line gets anchored into an account in such a way that they continue to purchase our products when new opportunities become available to us. 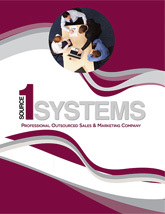 Source 1 Systems has also provided support to our company through their marketing resources division. Their graphic design department along with their video production division has taken our product branding to an entirely new level, and the response with customers has been fantastic. I highly recommend working with Source 1 Systems, as they provide the type of partnering relationship that a progressive company like ours is always looking for. McCalla Company and our customers want to thank you so much for your great presentation at Birmingham High School. We have had a lot of positive feedback from customers and our sales staff on what they thought about your program for janitorial training. We have such a large customer base that we haven’t even scratched the surface and would benefit by many more of these learning seminars. It has been our pleasurehaving Source 1 Systems as a partner in our sales and marketing efforts. Over the many years that our two companies have worked together, our company has been able to develop new markets and product segments that have added valuable and profitable growth. This has been as a direct result of Source 1 Systems’ experience and commitment in providing in providing the very best in everything that it does. Scott Shannon and the Source 1 Systems team have provided our school district with field expertise and training for our more than 200 custodians and supervisors for years. This support has allowed the district to improve dramatically the level of professionalism and safe use and practices with our staff in performing their jobs. Scott has worked with our people to identify the correct products and procedures needed to improve performance at the school sits, while working towards our goal of reducing the overall expense in products and supplies. Scott brings a wealth of industry knowledge, along with the ability of being able to focus the attention of a large group of custodial professionals on a goal of professional improvement. The professionalism, which Scott brings to our team, is invaluable. He provides great value added support for his products and service. Working with Scott and Source 1 Systems has been a sincere pleasure, and we are thankful to have them as a member of our extended team. It is a pleasure to write this letter of recommendation for Scott Shannon and his company, Source 1 Systems. We have found Scott, and his company, to be very proactive and skillful at working with distributors. Source One Sale’s success is attributed to the quality of the manufacturers they represent as well as their ability to provide the distributors with the sales and product knowledge necessary to make both distributors and manufacturers profitable. We are sure that no matter what lines they represent, or distributor they work with, they will be successful. We at Host strongly recommend Scott Shannon and his company, Source 1 Systems. It has been a pleasure and reward for our company to work with them. It is my pleasure to share with you my thoughts on Source 1 Systems. As a manufacturer, we are challenged with the goal to grow our product line, while working diligently to have the very best people to represent and grow our line with. People in place that know the market, know the potential customers, know the competition, and people that actually know the profession of “selling” itself. Source 1 Systems has proven to be the best decision our company ever made in this regard. Our company is made up of factory direct representatives as well as independent manufactures representatives that cover the United States and Europe. In the past we have struggle with independent reps. as we felt that we do not have their full attention, and that we are not getting our fair share of their time in marketing our products. With Source 1 Systems, we not only feel that they are truly focused on our line, but the fact that they have other product lines, has absolutely contributed to some of the largest segments of business that we now enjoy in the market. The Source 1 Systems team brings multiple lines to bear on a project in order to enhance the overall value to the potential customer. Source 1 Systems has been our Sales Representatives of The Year on three different occasions, and they have been a very strong performer in the years they did not achieve this award. What I feel really shows the type of company Source 1 Systems is, is the fact that the market has suffered over the years by having two of our largest customers simply go out of business. Source 1 Systems has worked effectively to continue to grow our line and add strategic distribution throughout the market and replace that business. We are truly in better shape now, with regards to market penetration, than we were when we had to two distributors on-line. We are Much more diverse, and much more protected from big sweeping changes in the market as a result. Source 1 Systems brings everything you could want in representation for your company. We highly recommend that you learn more about what Source 1 Systems has to offer, and how they can help your company grow and attain your market objectives. Hi Scott, I want to take this opportunity to acknowledge you for hiring such good rep/s for your organization. Beverley is always on the ball with introduction of new products and systems follow up. She always brings value to our meetings, which I really appreciate. I know that one of your biggest challenges, besides making a profit, is hiring and keeping great people. Although new, I can see the similarities in Ryan Boring as well. I think he will make great contributions to your business for us….$$$ and our long time partner relationship. I usually do not send message like this because frankly, I don’t see much of these qualities often enough and I felt it important that Bev and Ryan be made aware of my feelings on this, as well as you. Take care Scott, and I look forward to seeing you soon. For manufactures that have realized the huge upside benefit to working with Outsourced Professional Sales & Marketing Companies, the number one goal is to partner with the highest quality company’s possible. These companies draw on their people, their skills, and their multi-level marketing capabilities to make success possible for all parties involved. Source 1 Systems, LLC has been working for lnteplast as the company’s representative in their market. Achieving lnteplast Manufactures Representative of the year honors in the process. The Source 1 Systems team is highly respected in the industry, and has built that reputation on their hard work, smart marketing decisions, work ethic, and unwavering commitment to honesty and integrity above all else. Source 1 Systems is a professional organization that lnteplast is proud to be associated with, and looks forward to years of future success, in an ever changing, more competitive market environment.